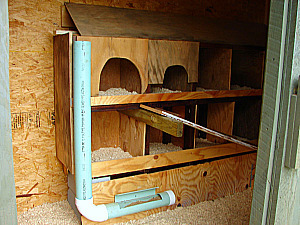 Free choice feeding method is the process of making feed available to the chickens at all times. This makes sure that chickens have food at all times. Chickens will only eat when they need to. Chicken feeding amount does not have to be regulated because chickens stop eating when they are full. However, some of the heavier breeds tend to gain extra weight when fed free choice. I feed my chickens using a homemade feeder, that I fill once a week. I still inspect it everyday, to make sure their feed is not wet, dirty, or moldy. I find that using this method saves me a lot of time and I know my chickens always have access to food. Show birds being kept on a strict diet. They will look forward to human visitors, in which they may be fed two times a day, 15 minutes per sitting. Older lightweight hens and breeders in the dual-purpose or meat categories ( keeps them from getting fat and lazy). Heavier breed pullets ( keep from maturing too quickly). Restricted feeding can be very time consuming when raising chickens. Birds in the lower pecking order may not get enough to eat and when birds are not eating they can get bored. This could lead to cannibalism. You need to weigh the options and find which method works best for you.